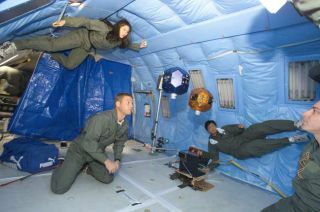 The MIT SPHERES team tested its mini-satellites in 2004 aboard a NASA plane used to simulate weightlessness. From left are team members Stephanie Chen, Steve Sell and Edmund Kong. A satellite no bigger than a volleyball has lofty goals aboard the International Space Station (ISS), where its exploits could lead bigger and better robots for orbital work. ISS Expedition 13 flight engineer Jeffrey Williams, currently aboard the station, is slated to deploy the first of three self-contained, free-flying satellites designed to hunt out a target for docking on May 18, NASA officials said. The experiment is part of the SPHERES project led by David Miller, director of the Space Systems Laboratory at the Massachusetts Institute of Technology (MIT), to develop a network of mini-satellites capable of formation flying. "To a large extent, this will give us a good shakedown to tell us that the software works," said Jonathan How, an MIT aeronautics and astronautics associate professor participating in the study. "We're all hoping that it works." The rudimentary docking tests on tap for the SPHERES project could help develop larger, more sophisticated systems to refuel satellites, coordinate positions among formation-flying space telescopes and enhance future spacecraft rendezvous systems, How told SPACE.com. This month's initial SPHERES tests have been a long-time coming for Miller and his team of graduate students. The small satellites were initially slated to reach the ISS in 2004 - then ISS Expedition 8 commander Michael Foale installed a rendezvous beacon for the free flyers in the station's Unity Node for their arrival. But the 2003 Columbia accident and subsequent shuttle delays prevented their launch. The first SPHERES unit arrived at the ISS on April 26 aboard the unmanned Russian Progress 21 cargo ship. NASA spokesperson Kylie Clem told SPACE.com that 26 pounds (11 kilograms) of SPHERES supplies, including one satellite, 10 battery packs, seven gas cartridges, a beacon and one laptop computer are now aboard the ISS. Two additional satellites will be delivered during NASA's STS-121 shuttle mission set to arrive at the ISS in July, she added. Miller's SPHERES - short for Synchronized Position Hold Engage Re-orient - satellite is a battery-powered, gas-propelled ball designed to use ultrasound signals to determine its position in space. Aboard the ISS, beacons have been installed inside the U.S.-built Unity node, though additional tests may be performed in NASA's Destiny laboratory module, Clem said. During next week's test, Williams is expected to set the small SPHERES unit adrift, then watch as the vehicle hunts for one mounted beacon and one handheld beacon while firing its carbon dioxide-fueled reaction jets, researchers said. "That will be a check-up for the SPHERE," Miller said in a statement, adding that he hopes the small satellite will be able to find and maintain a position in space with only 0.4 inches (one centimeter) of drift. While multiple SPHERES units have been tested aboard NASA's KC-135 aircraft, which offers brief periods of weightlessness during parabolic flights, the longer ISS sessions are vital to determine whether the mini-satellite's computers can handle autonomous flight, researchers said. "We're doing this because these missions have a lot of new, untried technology," Miller said. "Testing inside the space station will allow us to mature these technologies in less risky microgravity environment." Not only does testing inside the ISS prevent the loss of Miller's SPHERES units should something go awry, but it also gives astronauts a unique vantage point to observe the system and relay their findings to researchers on the ground. "The astronauts are the experiment's eyes," How said. "You get video, but it never fully explains what's going on." The initial SPHERES project is a joint effort funded by the Defense Advanced Research Projects Agency (DARPA), and NASA's Goddard Space Flight Center, Ames Research Center and Jet Propulsion Laboratory. Payload Systems, Inc. in Cambridge, Massachusetts built the SPHERES units for Miller's team. Depending on the performance of the first three SPHERES units, larger and more complex versions could follow, Miller said. How added that the technology could lead to improved automated docking systems for future Moon or Mars missions, where dependable rendezvous systems will be vital during spacecraft link-ups beyond Earth orbit. "Regardless of where we want to go, we will probably want to send a lot of infrastructure to the Moon or Mars, probably more than what we can lift with a single rocket," How said. "Rendezvous and docking are important, and automating that is a key part of that type of mission." Precise station-keeping capabilities would also be vital for satellite refueling pods to boost a spacecraft's operational lifetime, as well as for multi-vehicle space-based telescopes such as NASA's planned interferometer Terrestrial Planet Finder, which would use multiple free-flying telescopes acting in unison to serve as a much larger observatory. But before SPHERES can aid any of those efforts, the first vehicle has to run through its paces aboard the ISS. "It really is great to finally see it go up," How said of the first SPHERES launch aboard Progress 21. "It's always fantastic for the students to see the project go somewhere and fly."